Harkador | Summer time or is business slowing ? Summer time or is business slowing ? I started conceiving this blog post in August when things were indeed slow. My consulting business had very little new sales activity and I got to thinking: is it me, the economy or just summer. My first approach was to gather some data. I thought for a long time that email traffic, at least the volume of quality (more about quality later) email traffic, was a strong indicator of business activity in general and a good indicator of successful new business activity. Mid month, I found out how to Analyze (My) Email Usage with Mail Trends. Being that August was slow, I took the time to install Mail Trends on my Mac. I went back to my geek days and pulled up a UNIX terminal window and collected some insightful data on the 74,119 emails in my Gmail account. 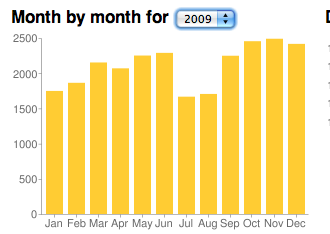 In 2009, email activity dropped to 77 % of the monthly average for July and August. 2010 was a little harder to interpret because the yearlong trend indicates a 134% jump in my monthly email volume over 2009. I believe the increased email traffic occurred mostly because of biking, triathlon and entrepreneurial email groups I joined. These meetup groups dramatically increased the volume of emails I received in 2010. Biking and triathlon activity is definitely July and August focused so what was a down month in the past for email traffic, is now an up month for low quality broadcast emails. 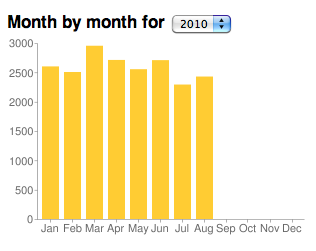 Nonetheless, July and August 2010 still showed email activity dropping to 84% of the average level of 2010. So, the bottom line is, business activity as indicated by email communications does slow during the summer. A better indicator would be the volume of “quality emails”, actual emails that involve two-way communication and not just the broadcasting of information. Google is attempting to help with the “quality email” issue with their new Priority Inbox. It would be great to be able to use their prioritization algorithm to evaluate my email traffic. Perhaps the talent behind Mail Trends can incorporate this feature. Kevin McCarthy took a different look at the summer slow down phenomena by analyzing the number of blog posts during the summer and came to a similar conclusion I did, activity is down in July and August. I for one added to the decrease in blog posts by waiting until September to write this post. In general gauging the business climate is tricky, and particularly hard for early stage businesses where a single new customer can have a huge impact on your prospects. Business did slow during the summer. Despite the slowing, one of the companies I work with closed on a significant investment from multiple sophisticated investors during July and August. So while you can plan for a slower pace during the summer, do not accept that business just won’t get done. Speaking of summer is important to have a good roofing at your home on summer, check the best roofing experts for that why not try these out. The macro economy is slowing, but I am bullish on the prospects of all the companies I am working with. Despite still being pre Labor Day this week, I have seen a distinct up tick in business activity and I am excited about the prospect for the fall. What do you think? Will the entrepreneurial economy bounce back starting next week?